The tantalizingly brief Skyrim teaser trailer debuted by Bethesda Softworks late last year filled my mind with visions of titanic battles between man and beast; of shining steel bathed in ancient flames; of a champion rising from humble origins, prepared to sacrifice everything for the fate of the world. After 60+ hours with the game those visions have been fully realized — and rendered largely inconsequential. It's the sort of tale that fuels ancient epics and trashy fantasy novel trilogies alike, certainly sufficient enough to serve as the plot for the average role-playing game. This is not your average role-playing game. In The Elder Scrolls V: Skyrim, this titanic tale is merely a framing device for a much larger story. Battling a dark dragon god is merely an excuse to plunge the player headfirst into this immense Nordic-themed fantasy sandbox, much like the murder of Emperor Uriel Septim VII served as a gateway into Cyrodiil in The Elder Scrolls IV: Oblivion. In grand Elder Scrolls tradition the players begins the game as a prisoner, confined to an exciting but linear introduction before being set free from the cages imposed by more structured role-playing experiences. You can return to the cage at any time, but there's a whole wide world to be explored, and what the hell, it's not like Alduin set a date for the destruction of everything; overwhelming evil's flexible work schedule is one of my favorite aspects of the series. Unhampered by a ticking doomsday clock, the player is free to reconnoiter the beauteous countryside of Skyrim to their heart's content. Far-removed from the alien landscapes of Morrowind, its neighbor to the east, Skyrim's rolling hills, frigid tundra, and towering mountains wouldn't be out of place in a real-world nature documentary. I could easily see myself climbing its peaks, delving its depths, and crossing its streams (sometimes that's okay), and when the dragons make their appearance this realism serves to make those encounters all the more terrifying. But those dragons, so immense and impressive at first, soon became nothing more than an occasional interruption in my personal tale, dropping out of the sky just as I was about to enter a mysterious dig site at the behest of the Mage College or worse, bringing an early end to high-spirited games of Herd the Moose. I never said my story made sense. I'm not sure if it's a testament to Bethesda's open-ended game design or my own frivolity that in a world filled with thousands of built-in activities I spent several hours making up my own. I earned no skill points for relentlessly pursuing elk across the frozen wastes, cliff-diving into shallow pools, or attempting to cross entire towns using only rooftops, but I felt just as fulfilled as I did when I was swiping a valuable trinket for the Thieves Guild, deterring a rambunctious bard from pursuing an unwilling maiden, or battling Dark Elf racism with my bare fists. Skyrim is the ultimate OCD adventurer's playground, packed so full of entertaining new experiences that you can barely complete before the next appears on the horizon. When all was said and done my 60+ hours of adventure consisted of perhaps seven hours with Alduin and company, ten hours of random exploring, and the rest of my time spent devouring just a small portion of the side quests—the real meat of the game. Ranging from short fetch missions to adventures so lengthy and memorable they rival the core story, it's almost insulting to call them side quests. They are the beating heart of Skyrim. Traditionally a single-player game, Skyrim has spawned its own social multiplayer component. Traditionally a single-player game, Skyrim has spawned its own social multiplayer component. By stocking the game with so much content that only the most dedicated player (or those armed with strategy guides) could hope to see it all, Bethesda has created an ever-growing community of storytellers, each eager to hear the unique tales of others while sharing their own. It's happening on internet message boards. It's happening on Facebook and Twitter. It's even happening in game stores, where the mere mention of the game's name evokes spirited conversation between total strangers. As I write this I'm actively resisting launching into tales of my mage's exploits. He's really rather keen. 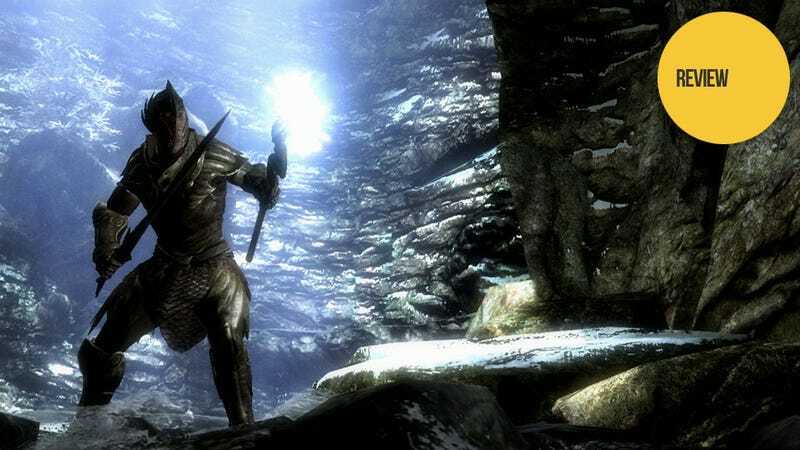 Skyrim is not a flawless game by any measure, but where fans of other titles might rise up against rampant glitches and shoddy programming, this impassioned community has embraced it. Thrown into the air by a giant's club? That's hilarious. A horse that mysteriously blinks in and out of existence? He's our legendary steed. An overall lack of proper combat targeting? Damn those stupid non-player characters for jumping in front of my fireball. I've seen accusations since the game's release that reviewers are giving Bethesda a pass because their games are always flawed, but it's not the reviewers. Hell, I'd take ten points off right now if a) we used a point system and b) I wasn't afraid of being trampled by an angry mob. In the early hours of The Elder Scrolls V: Skyrim a single word is heard, echoing from the heavens. "Dovahkiin" exclaims a mysterious voice, urging you to embark on a heroic quest to save the world. "Dovahkiin" is also Bethesda's call to arms, beckoning any gamer that's ever dreamt of traversing a magical land armed with spell and steel to an unforgettable role-playing experience. Ignore it at your own peril. The Elder Scrolls V: Skyrim was released on Nov. 11 for the PlayStation 3, Xbox, and PC. Bethesda Softworks provided Kotaku with a copy of the game. Played 20 hours of the game on Xbox 360 before switching to PC. Played through full single-player story on PC. Tested both melee and magic-only characters. Chased a hell of a lot of elk, moose, whatever.